This Aluma-Trans case is extremely durable. It holds two pistols comfortably and comes with two loop latches and an eyelet for a padlock.. This case also has a weather-seal system that keeps dust, dirt and moisture out. The interior is compression foam and the exterior is made of .063" aircraft aluminum. Interior Dimensions: 17" x 12" x 5"
Exterior Dimensions:18" x 13" x 5"
Aluma-Trans adds to the multitude of products manufactured by Americase with its extreme versatility in custom designs and sizes. Aluma-Trans cases are constructed of mill-finished aluminum and industrial quality hardware. 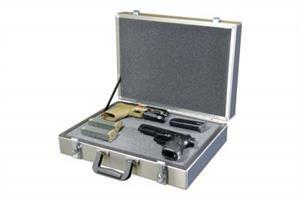 The high security locks used on this line are the most secure of any commercially manufactured carrying case. This advanced construction yields a case that is virtually impenetrable. This line was designed with adaptability, strength and protection in mind. Lightweight and with recessed hardware, Aluma-Trans meets the quality standards required of all Americase products.